There is no formal episode this week but that hasn’t slowed me down in finishing a few things. Wet yarn is hanging in our bathroom as I type and a newly finished shawl hangs behind me on my dress form. I talked about this shawl in the last episode of Wool n’ Spinning but I wanted to share some photos I took of the shawl and talk a little bit about how the shawl is holding the very aggressive block that I gave it. 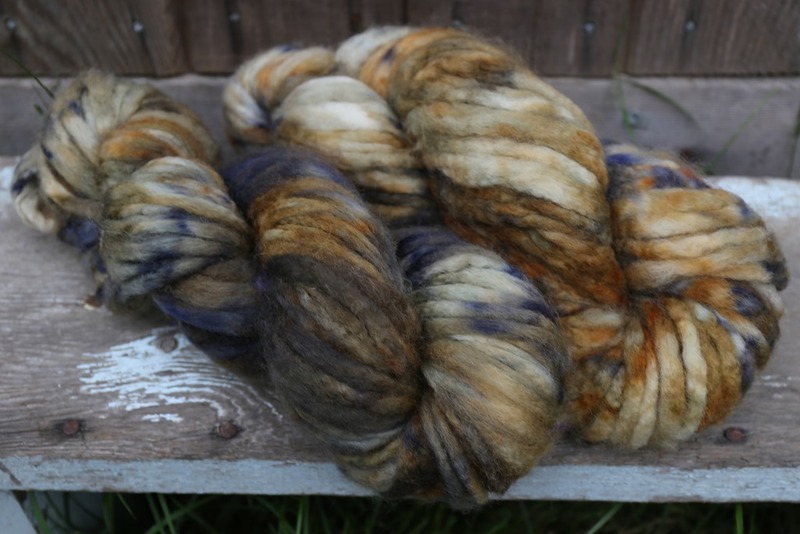 I wanted to talk about this briefly only because the fibre is Superwash BFL and I’ve heard from others that sometimes SW does not hold its block well. I have found this to be true – mostly because the SW process removes the scales from the wool that makes it able to withstand being agitated: No felting. I have found in my trials that soaking my SW fibres in extremely hot, soapy water and then blocking aggressively with wires and pins really helps the item to keep its shape. This has not failed me yet and while I usually have to re-block after a year of wear, that is true of all of my woolens. Well, that’s not really true. Socks are the exception! The aggressive blocking meant that the shawl stretched to about my wingspan, which ended up being about 65 inches. The depth of the shawl is slightly more shallow because I increased on 3 out of 4 rows from about 2/3rds down the side of the shawl onwards until the end. This created a longer wing and makes it perfect for draping around my shoulders. 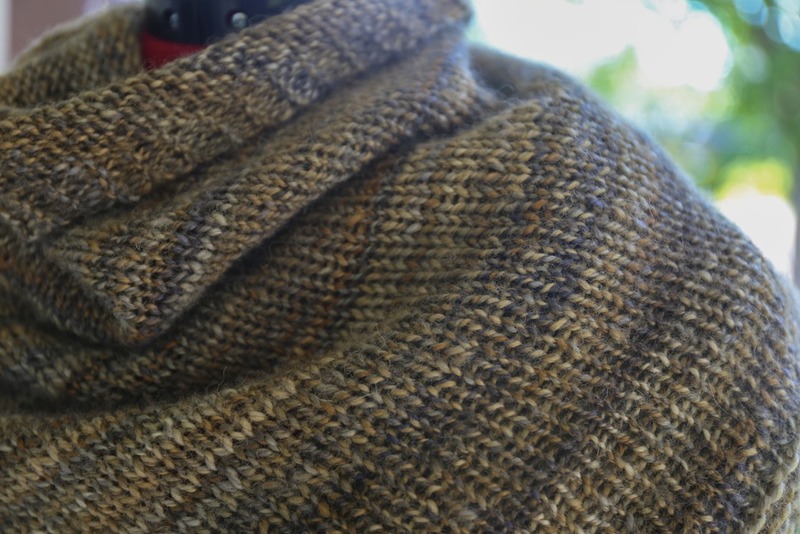 The shawl is warm, which is a lovely side effect to a relatively light, airy yarn. I spindle-spun this yarn on my Turkish spindles and it created a lovely yarn – not too heavily twisted but a nice, tight twist angle at the end regardless. I will say that I wished I had paid more attention to the weight of yarn I was spinning because the last two 25 gram balls that I spun were DK then worsted respectively. The other two 25 gram hanks were sport. To compensate for these differences, I increased my needle size as I came to these hanks – so the first part of the shawl is knit on 5.00mm needles, then the 3rd hank is knit on 5.5mm and then the last on 6.0mm needles. It actually worked like a charm! Knitting so loosely towards the end created lovely drape. 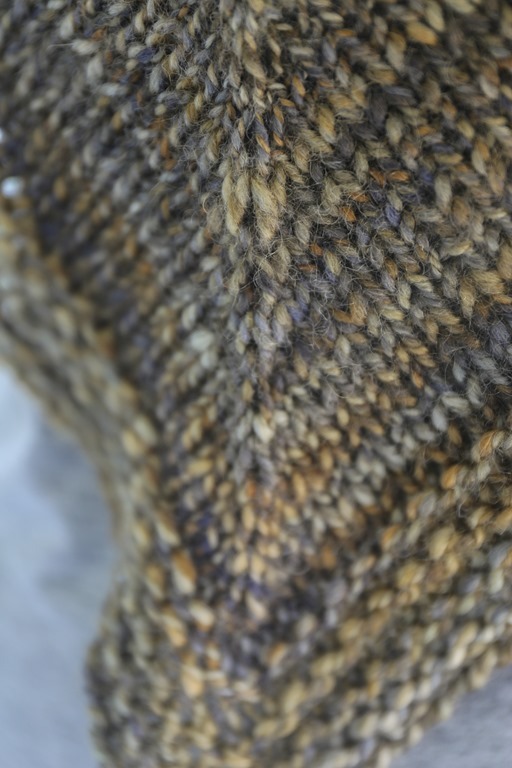 It also gave the shawl the bump in size it needed to really be the perfect width and length. Above: Pencil Roving from Smith and Ewe, Kamloops, BC in SW BFL; Below: Traditional 2-ply yarn after stripping each pencil roving vertically and spinning end-to-end. 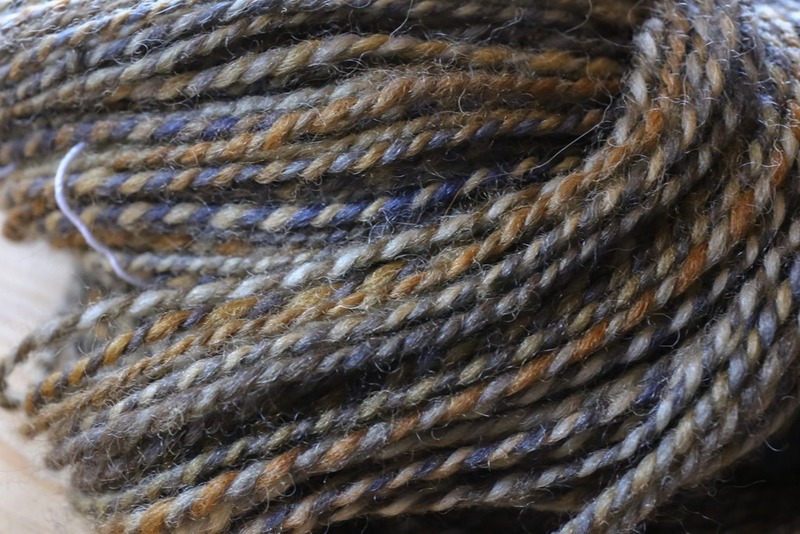 I personally love seeing the fibre, yarn and finished object together in a row – I hope you love it too! I think there is so much we can learn from it. For me, the reason I love this shawl so much is because of the simplicity of the design. 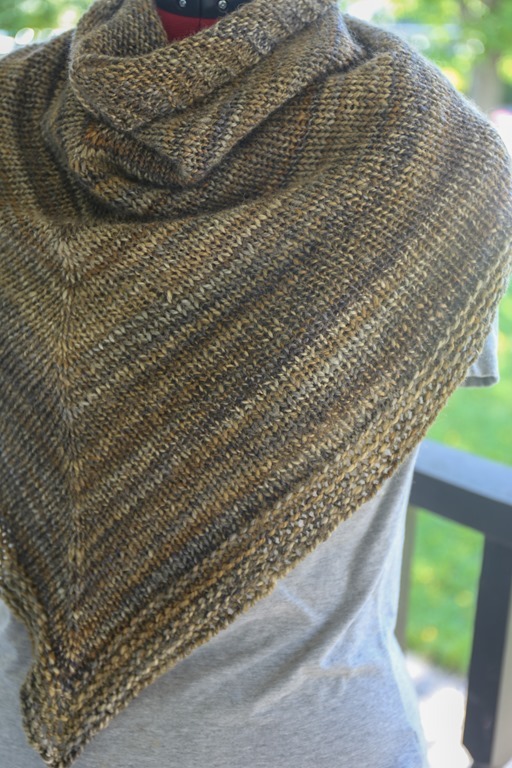 There’s nothing more simplistic than a simple triangular shawl, so there’s absolutely no competition with the yarn which I wanted to highlight because I was so in love with it. The blues and golds aren’t lost because of the simple design – that’s what I love the most! I’ll be wearing this everyday in Fall and I can’t wait! Between you and me, I’m kind of glad I’m wearing it today since it’s rainy and not at all like an early-summer day, especially since it’s my birthday! Happy birthday. Is it the 14 th where you are? It’s just after 9 pm, 14/6 in the Southern Hemisphere in Tasmania. The date line really confuses me. 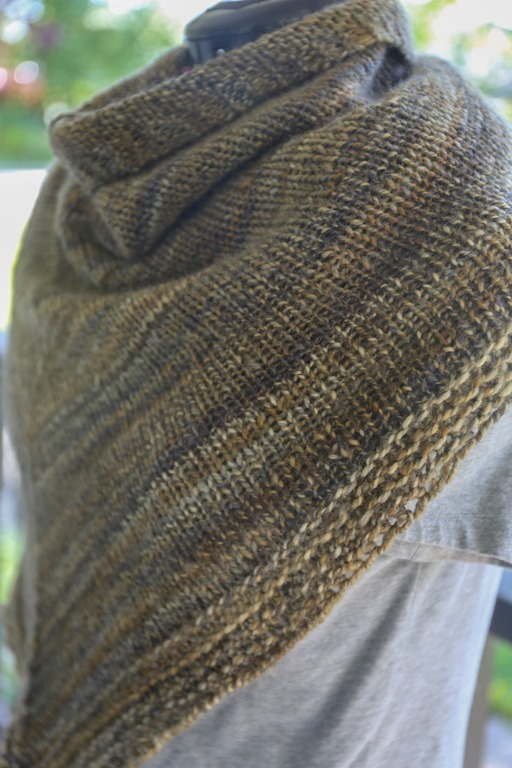 I am totally with you — a simple shawl is absolutely the best way to show off the beauty of handspun! Love the shawl, Happy Birthday! Hope you had a great birthday Rachel 🙂 and that’s a lovely shawl to curl up in through this June-uary weather. Rachel, those colors are so very YOU. 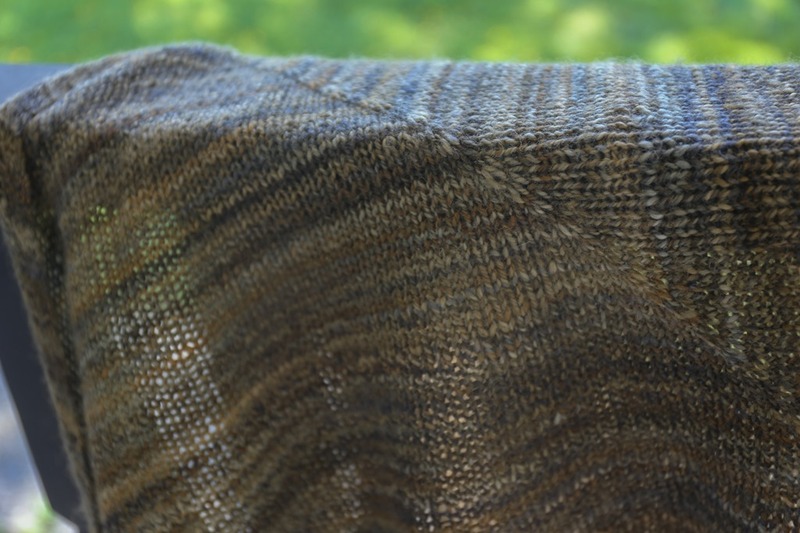 And I love seeing how you managed to keep the colorway so stable from the pencil roving to the 2-ply to the shawl. You are truly a color spinning master 🙂 Well created and beautifully executed!